On this date in 820, holiday sentiment cost the Roman emperor his life. In the unsettled aftermath of Byzantium’s devastating 811 defeat at the Battle of Pliska, the military took the lead in the person of the formerly disgraced general Leo the Armenian. In 820, Leo got suspicious of Michael and had him condemned to death for plotting against him. But since this grim judgment came down just ahead of Christmas, the emperor graciously gave his comrade-turned-prey a holiday respite. This leniency was one of the very last acts of his life. When your head ends up on the currency instead of a spike. It has been famously said that the prospect of imminent execution concentrates the mind wonderfully and that was never truer than for Michael the Amorian. Leo had been right to suspect him of treason — and Michael was able to get word to his co-conspirators to act immediately, lest he betray the lot of them to his inquisitors. On Christmas morning, Michael’s cronies did just that, ambushing the emperor as he prayed in the chapel of St. Stephen where they cut him down dead — then raced to the palace dungeons to liberate Michael and hail him emperor so hurriedly that he was still partially manacled. Michael would rule capably for nine years and pass the throne to his descendants, initiating the Amorian or Phrygian dynasty. 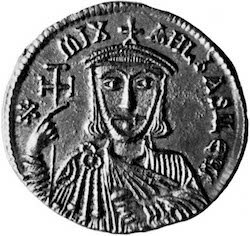 The events surrounding this dramatic regime change are covered on the History of Byzantium podcast in episodes 98 and 99 (all about Leo’s reign, culminating with Michael’s coup), and episodes 101 and 102 (all about Michael’s reign). * Leo also restored the controversial policy of iconoclasm, a policy that Michael continued in his own turn to the profit of this here site.